Holocaust. The very word itself causes us to bow our hearts and our heads, both in prayer and in horror. The origins of the word itself (from the Greek ὁλόκαυστος holókaustos: hólos, “whole” and kaustós, “burnt”) conjure up horrific images of the ovens of the Auschwitz crematorium. To take a moment to stop and truly contemplete what the smoke belching from those chimneys actually represented, we run the risk of facing complete insanity. Our innocence was shot to pieces at Treblinka; our belief that man is basically good was beaten to death at Sobibor; our hope for humanity’s future was ripped to shreds at Ravensbruck. The Holocaust becomes more horrific, more difficult to digest, and more impossible to ignore, when one also considers that it was systematically and intentionally planned, and orchestrated and executed with an evil, insane perfection that only the Third Reich could muster. Every arm of Germany’s bureaucracy was involved in the logistics of the genocide, turning the Third Reich into “a genocidal state” (1). Our hearts are broken with grief, more than 70 years later, to realize that Hitler’s “Final Solution to the Jewish Question” was unbelievably close to… finalization. The numbers are staggering – of the nine million Jews who had resided in Europe before the Holocaust, approximately 66% (or 6 million people) were mass-murdered – one million of those being children (2), almost completely shutting off the entire future blood line of the Jewish race. Poland once had the largest Jewish population in Europe – more than three million – until 90% were murdered in the Holocaust. 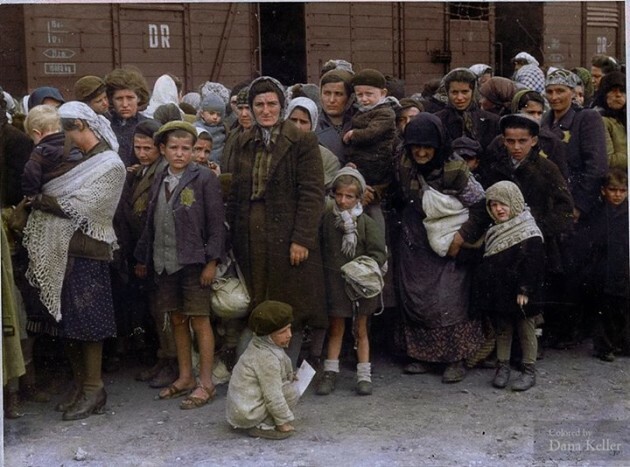 Concentration camps were also filled with Gypsies, Poles, communists, homosexuals, Soviet POWs, and the mentally and physically disabled – in total, approximately 11 million people were killed, using a network of 42,500 facilities in Germany and German-occupied territories to concentrate, confine, and kill Jews and other victims. Between 100,000 and 500,000 people were direct participants in the planning and execution of the Holocaust. At the centre of this evil was the extermination camp system Auschwitz-Birkenau – though most may not know that it was actually an organization of 48 camps, consisting of Auschwitz I (the original camp), Auschwitz II–Birkenau (a combination concentration/extermination camp), Auschwitz III–Monowitz (a labor camp to staff an IG Farben factory), and 45 satellite camps. At the height of its horror, the camp processed and executed 25,000 people a day – with a final death toll of over one million people. Today, one outside wall at the camp bears a slogan, written in 5 languages – the simple phrase “NEVER AGAIN”. But less than 50 years later, we had already…. forgotten to never forget. On April 6, 1994, the plane carrying the President of Burundi and President Habyarimana of Rwanda (the latter a Hutu by race) was shot down over Rigali, Rwanda’s capital. 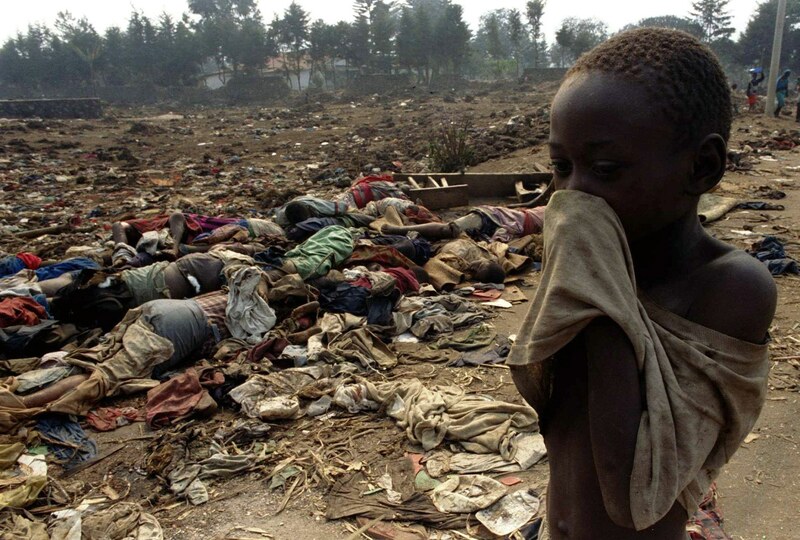 Almost immediately, the Hutu majority (85% of the population) in Rwanda pointed the finger of blame on the Tutsi minority (14%) that lived amongst them. What happened next was so horrific it beggars description. The Rwandan military whipped machete-armed civilians into a 100-day bloodbath – and an estimated 800,000 people were killed. When it later came to light that the Hutu majority actually conspired to kill their own President & party leader in order to start this genocide on purpose, one could be forgiven for going catatonic. Now fast forward to March 2011 and the unrest across the Middle East – a drama that played out on our nightly news broadcasts for weeks and weeks. This was something new, progressive, exciting – even liberating – as an “Arab Spring” blew its winds of change across the Middle East. Egypt fell first, throwing a President in jail and electing one from the Muslim Brotherhood, with connections to Muslim fundamentalism. In Syria, it began with protests agains President Bashar al-Assad‘s government. It was hoped that this “Arab Spring cleaning”, if you will, would bring real change to this country. The conflict gradually morphed from prominent protests to an armed rebellion after months of military sieges and local skirmishes between pro-Assad government forces and opposition factions like ISIS (Islamic State in Iraq and Syria) – now known as ISIL (Islamic State of Iraq and the Levant) – the latter referring to the region of the Middle East including Cyprus, Hatay, Israel, Jordan,Lebanon, Palestine, and Syria. Since then, this conflict has broken out into an all-out Syrian Civil War. The chaos, human suffering and destruction has now reached almost Biblical proportions. Yet, to watch the vast majority of news networks today, you’d think the war was long since won and ended. “Out of sight, out of mind” has always been a problem in the West – we see what we want to see, and in fairness we will even tolerate and respond appropriately when we are shown what we don’t want to see – as ISIS and Boka Haram have clearly demonstrated. However, our society does not go looking for where pain and suffering exists. There are always fringe elements that do – be they missionaries, aid organizations, or people that have a love for a particular country for various personal reasons. The vast majority of the world has stopped caring and changed the channel on the issue, didn’t bother to learn about it in the first place ….or, as we suspect is likely the real problem – we haven’t been given enough information by the only sources of media we have, in order to make an informed decision to care or not. The Calling Out Community believes many residents in the West would care more if we knew how bad things had become – but our media outlets predominantly have failed us in reporting the scope of this crisis. This has been corroborated by a news reporting analysis conducted on the Syrian catastrophe by the Conversation, a non-profit educational entity hosted by Boston University’s College of Communication, with support from the Bill and Melinda Gates Foundation, Reuters, University of Birmingham (UK), the Commonwealth Bank of Australia and many others. 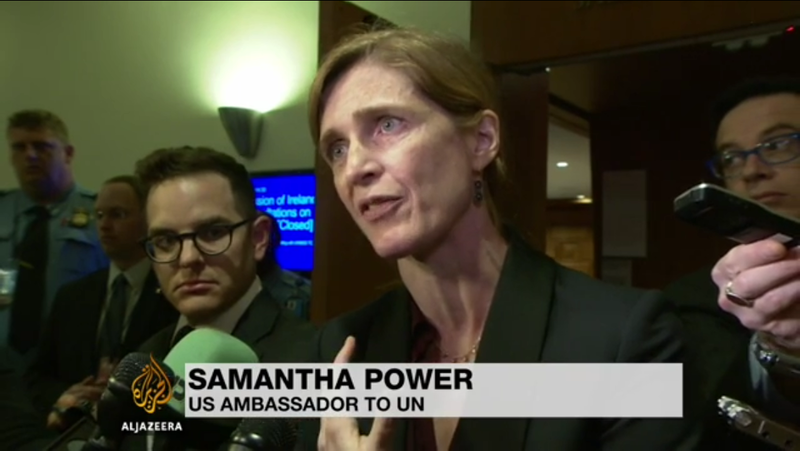 ​ “February 2015 has already seen some major developments in Syria’s four-year conflict. At the start of February, rebels launched more than 100 rockets into Damascus and the Assad regime fired mortars on areas of its own capital, hoping to discredit the insurgents. At least six people were killed in the attacks. 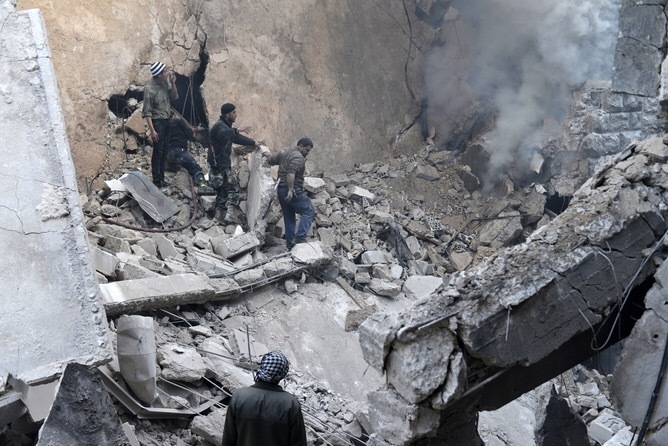 Then came almost 50 regime air strikes on opposition-held areas near Damascus, which killed at least 82 people. Another 25 were killed in Aleppo when a barrel bomb hit a bus on a roundabout. Meanwhile, rebels also claimed to have blown up 30 men fighting for the Assad regime – Hezbollah troops, Iranians, and Iraqis among them – at a militia headquarters west of Damascus. “If you read The New York Times, you are unlikely to learn about much of this; the newspaper has no reporting from correspondents, only a Reuters report. The same is true of the Washington Post, CNN, and al-Jazeera English. And the BBC? As the attacks and the deaths mounted on February 5, its lead story was on the conviction of former pop star Gary Glitter on sexual assault charges; the corporation later made partial amends on its website with a story headlined Syria Conflict: Dozens Killed in Heavy Damascus Fighting. Recent warnings from aid groups in the region, and statistics gathered by government entities, now paint a picture of such overwhelming horror and catastrophe, the 15-member United Nations Security Council will need to either act now – possibly militarily – or be held responsible for allowing this crime against humanity to continue. 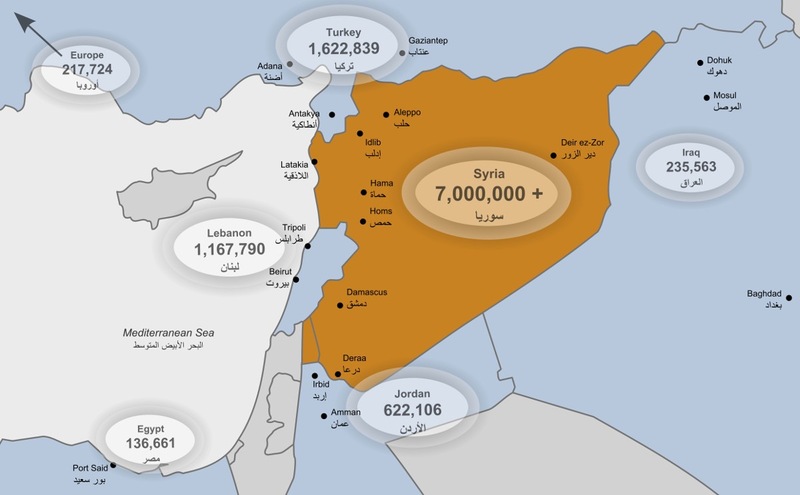 According to a March 12, 2015 New York Times article, nearly 50% of Syria’s total population – over 7.6 million people – have been forced from their homes by the Civil War, with 3.9 million more – half of them children – seeking refuge in other countries, according to figures collected from various United Nations agencies. 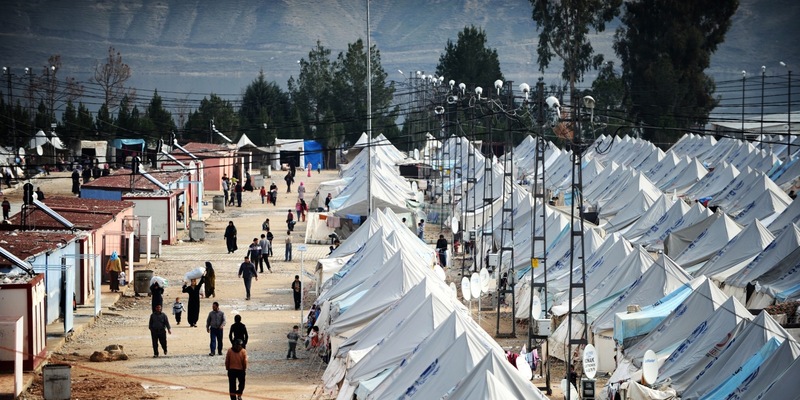 The website of the United Nations High Council on Refugees (UNHCR) reports that Syrians are now the world’s largest refugee population under their care. According to the CNN report, this crisis is the equivalent of the complete emptying of Greater Boston and the displacement of its 7.5 million people, as well as the starvation of the entire population of Moscow, the capital of Russia. From a Canadian perspective, imagine the combined metropolitan populations of Toronto and Calgary being forced from their homes – over 7 million people – because of a war that has literally ripped cities apart. Visualize if you can, simultaneously,. that all the residents of British Columbia have started to flee across the border, to live in the wilderness of Washington State – with only the clothes on their back. No food, water, medicine, shelter. Now picture that 50% of them are children. The United Nations has held at least one donor’s conference from wealthy countries, to try to raise enough funds to feed and take care of those displacement. The budget? $6 billion. 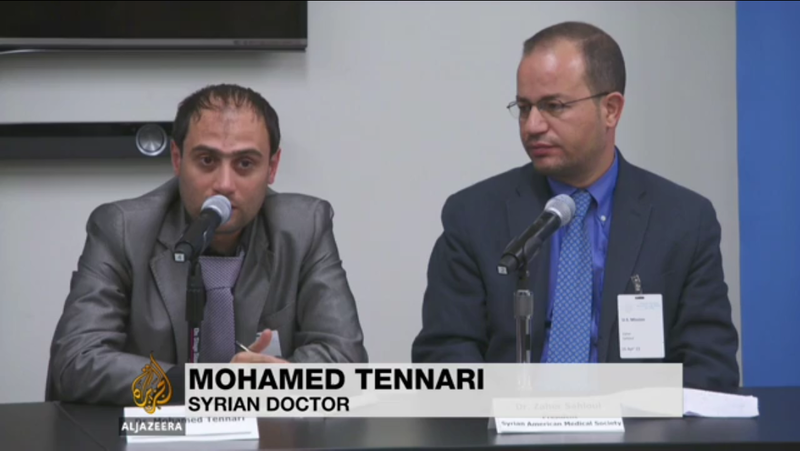 On Thursday, April 16, Dr. Mohamed Tennari addressed the United Nations Security Council and showed a video of a suspected chlorine attack March 16 in his town of Sarmin in Idlib province, including graphic images of three children, ages 1 through 3, dying despite attempts to resuscitate them. The medical area was so cramped that one of the children was lying on top of their grandmother, who also died. “Everyone smelled bleach-like odours and heard the sound of helicopters,” Tennari later told reporters after showing them the video. He said most of the victims were women and children. Well now it’s happened again – and women and children are dying. The Security Council must act immediately to bring those responsible to justice. The crisis has reached a point where it’s impact can now even be viewed… from space. On 12 March 2015, The New York Times published an analysis of satellite photographs taken over Syria in March 2012 (the 1st anniversary of the start of the Civil War) and again in December 2014. The photos clearly show that the country is now 83% darker at night than it was previously. Widespread migration is one of the main causes. Reading the enormity of the situation, one could be forgiven for feeling very small, insignificant and useless to do anything about this crisis. Not true – there are several practical things that we encourage everyone to consider doing. Samaritan’s Purse – Islamic militants with ISIS continue their persecution of Christians and attacks against people in the Middle East. Samaritan’s Purse has been actively on the ground for more than two years, caring for thousands of Iraqi and Syrian families who have fled for their lives with only the clothes their backs. UNHCR, the UN Refugee Agency – is the world’s leading organization aiding and protecting people forced to flee their homes due to violence, conflict and persecution. Canadian Red Cross – Syria Crisis Fund – the Syrian Red Crescent is actively working inside Syria to assist two million people a month who have been displaced, while the Syrian Red Cross assists with the refugees who have fled to other countries in the region. PRAY– only God himself can resolve this problem now – with so many factions at war with one another, and so many innocent lives in the middle, there is no hope but a miracle for this region. (1) Dawidowicz, Lucy (1975). The War Against the Jews. New York: Bantam.——— (1981). The Holocaust and the Historians. Cambridge, MA: Harvard University Press. (2) Fitzgerald, Stephanie (2011). Children of the Holocaust. Mankato, MN: Compass Point Books. Previous PostDid Comrade Obama Bankrupt America? Next PostIt’s ‘High’ Time To ‘Get Off the Pot’!